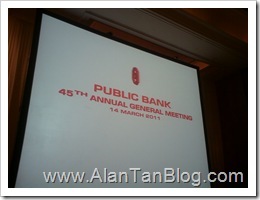 I attended the Public Bank’s annual general meeting(AGM) yesterday at the Shangri-La Hotel ballroom in Kuala Lumpur. This year AGM is very special because on 14th March 2011 is also the founding chairman Tan Sri Teh Hong Piow’s 81st birthday. 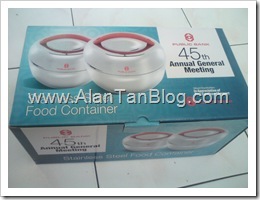 This AGM was the 45th AGM. Tan Sri Teh Hong Piow founded Public Bank, Malaysia’s third largest lender by assets, on 1966 and have impressive track performance record. Public Bank was the country’s third largest bank by net profit and assets, and is ranked number one in terms of how well it manage shareholders’ money to generate more profit and value. Over four thousand of grateful shareholders sang him a spirited version of "Happy Birthday To You", followed by "May The Good Lord Bless You". The whole AGM was full of applause and never a dull affair. 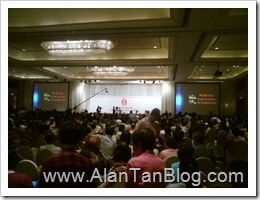 This never happen with any other AGM and is very rare in corporate Malaysia. Mr.Leong Kwok Nyem, Chief Operating Officer say Public Bank expects to maintain its dividend payout ratio at about 50% in the medium term and the bank doesn’t need to raise any capital to meet the requirements of the Basel III norms, and that all capital ratios were "healthy,"
Without failed, Public Bank able to deliver consistently generous cash dividends for their shareholders. Under Basel III, banks will face restrictions on dividend payments and executive pay if their capital falls below 7% of their assets, measured on a risk-weighted basis. Basel III will also require banks to keep more liquid assets, so they can meet daily funding needs for 30 days. Last January, Public Bank declared a second interim cash dividend of 25 sen per share and a single-tier dividend of 8 sen, taking the total gross dividend for 2010 to 58 sen.
It’s advisable to take a public transport when attending Public Bank’s annual general meeting even free car park is provided. This is because the parking unit at the hotel is rather very limited with over 4,000 shareholders attending. 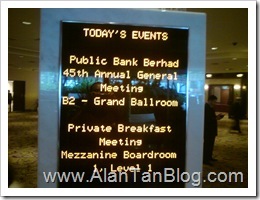 I use KL Monorial which stop at Bukit Nenas station and just a short walk to the Shangri-La Hotel ballroom in Kuala Lumpur. Did you know that if you had purchased 1,000 Public Bank shares since 1967 and have held it over a period of 42 years, your initial investment would have grown to a value of over RM2.1M today! The next question is can all this be sustain without any proper succession planning. 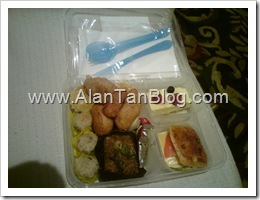 This entry was posted on Tuesday, March 15th, 2011 at 9:52 pm	and is filed under stock market. You can follow any responses to this entry through the RSS 2.0 feed. Both comments and pings are currently closed.